But—because I promised you a recipe!—one of the coolest experiences was learning about chai tea: how to make it, how to serve it, and how it’s different in each region of India. Each region in India puts its own special twist on classic chai, and lucky for me, Kolkata’s signature is a few threads of precious saffron. The overcrowded streets bustle with local vendors selling small cups of the saffron-laced chai. 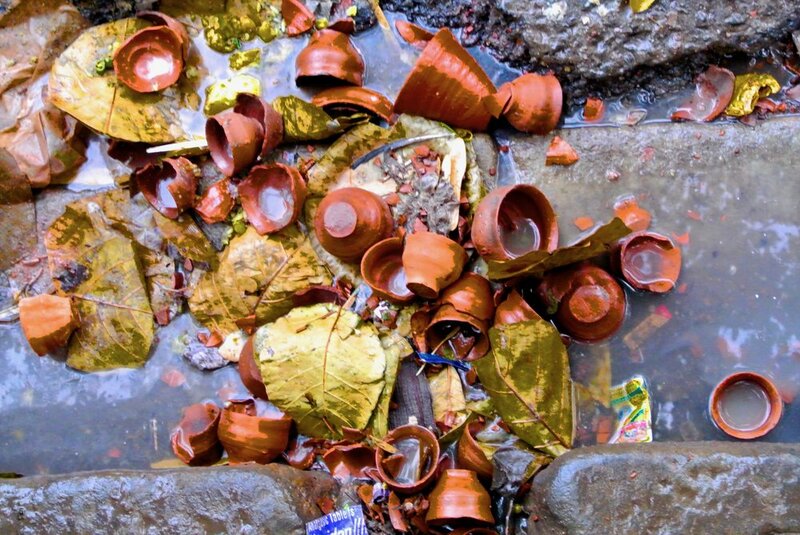 By noon, in any gutter in Kolkata you can find smashed clay cups, once filled with spicy warm chai, waiting for the rain to wash them back to earth. And before the sun, many potters are up happily throwing thousands of new cups, recycling the clay from yesterday’s disintegrated cups. I was envious of their ability to create for the sole purpose of quick consumption then destruction. And to do it again, day after day. But I realized they weren’t focused on the thousands of clay cups they had already made, or the thousands that will get smashed in the gutter later in the afternoon, they focused on making one little perfect clay cup, right here, right now. So no, don’t try to make your own clay cup, or smash your favorite mug today. But make some homemade chai and try, even if for five minutes, to ease your mind into the present moment. Sipping hot, homemade chai tea. Doesn’t that feel good? Use the bottom of a heavy bottom sauced pan to gently crush the first three ingredients. Transfer to a medium saucepan and add cinnamon and ginger. Add 3 cups of water and bring to a boil. Once boiling, cover pot and reduce heat and simmer for 10 minutes. Remove from heat and add black tea and steep for 6-7 minutes, then strain. Fill a mug 2/3 with the tea, and 1/3 with milk of your choice. Add about a tsp of honey to taste! If using saffron, top each cup with a few threads. To enjoy throughout the week, double the recipe and complete steps 1-3. Cool tea then transfer to a pitcher and store in the refrigerator. When you’re ready to use, warm one cup and combine with milk and honey.